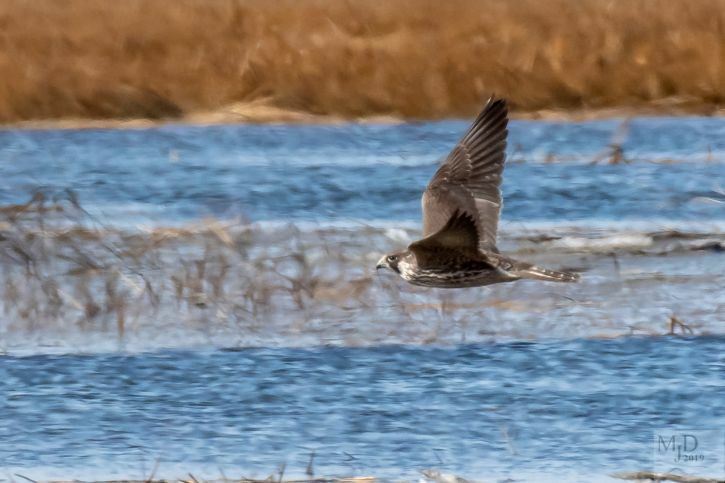 Posted on February 8, 2019 by David M.
In my message about returning to Plum Island this week, I noted that it has been very interesting birding there lately. This week, Dave Weaver, our 30 companions, and I found that the excitement continues! 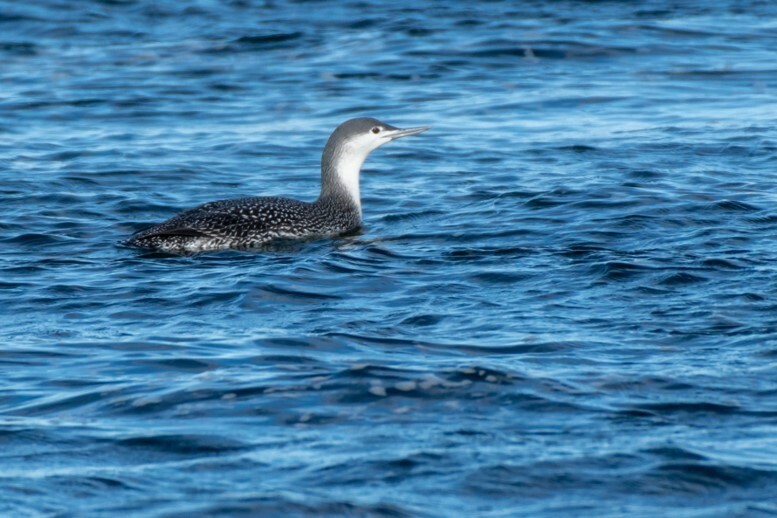 Arriving at the north end of Plum Island on February 6, we found a good-sized gyre of sea ducks and loons very near the shore, in an eddy on the island side. Normally, we find rafts of sea birds either in the center of the river or over near the far side. It was rewarding to be so close to many Common Eiders and both Black and White-winged Scoters. 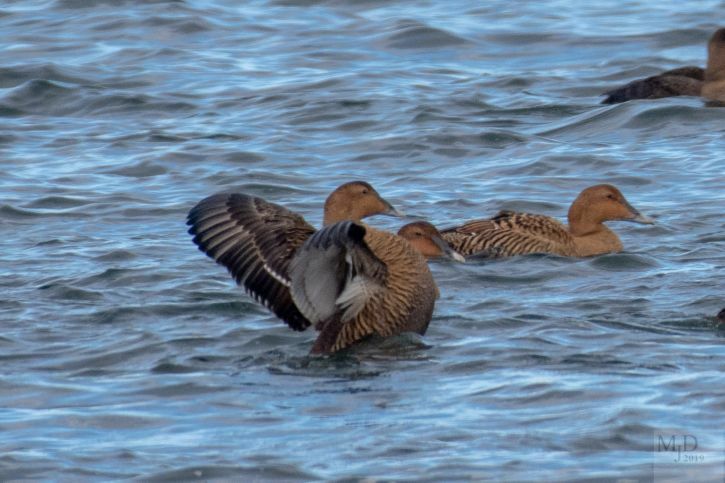 The eiders were very noisy, with a constant chorus of grunt-clucks as they actively courted. Three Common Loons foraged nearby, and finally a Red-throated Loon made an appearance for Wednesday Morning Birding. We haven’t recorded one of those for a long time. Common Goldeneyes were scattered all over the tide covering Joppa Flats, all the way to the western shore of the north end. 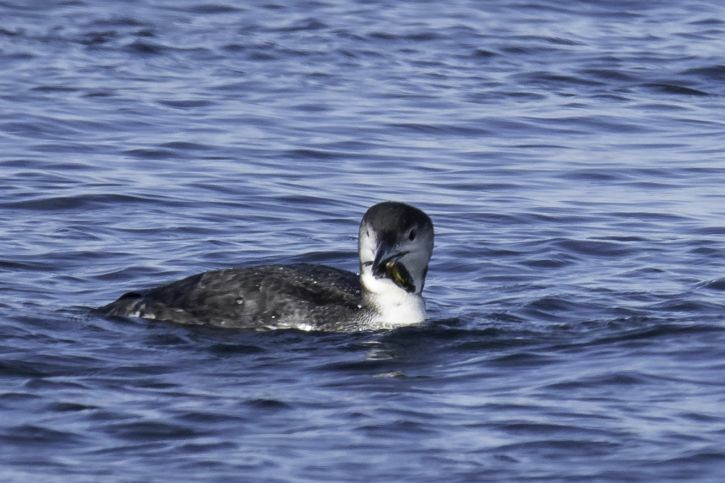 Notably absent this week were Long-tailed Ducks, which have lately been the big show. After searching the river for rarities without luck, and enjoying close-up views of our typical winter species, we moved on to the platform at parking lot #1 on Parker River NWR. Birding was tough up there, with a strong onshore wind and heavy chop. 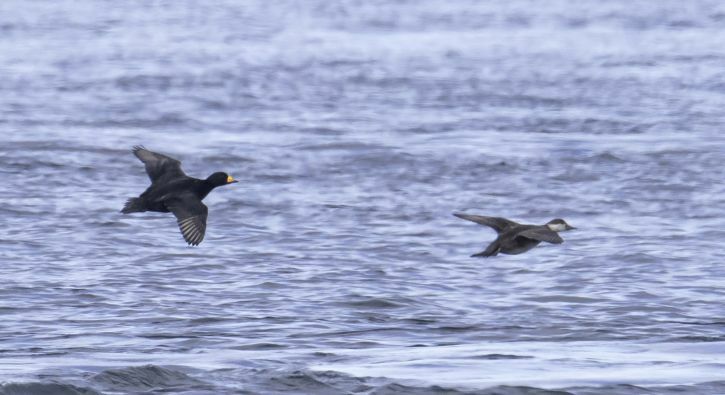 Scoters could be spotted briefly, and one skilled member of the crew had a view of a Horned Grebe, but really only birds in flight could be seen enough to identify them well. The prize for our effort was a flying Razorbill, visible long enough for folks to try to discern why that bird looked different in flight than any duck out there. No owls could be seen from the dune top, so we moved on to the road. One of us had found Snowy Owls earlier, so we were happy, but not surprised, to find two in one binocular field near the Main Panne. One of them was the completely white bird we assume is the same individual we saw last week. Not a speck on him (her?). The S-curves were very quiet, with only a few individual birds appearing on either pass that day. We had more than enough time for Hellcat. But since Emerson Rocks would be covered by the tide, we made a “Hail Mary” trip south, with a stop at Stage Island Pool. Once again we found a Rough-legged Hawk perched in the copse of trees on the south side of Cross Farm Hill. It took off and disappeared, though we did find it later on an Osprey platform, and then watched it perform satisfying RLHA behaviors over the hill. This week we also found more Mute Swans than usual, with an entire family near Stage Island. After enjoying the family of swans flying over us, and the antics of the Rough-legged Hawk, we left for Hellcat, satisfied that sometimes a whim pays off. The dike at Hellcat was as desolate as we expected it to be. Tire tracks led us to discover a pile of sections of the old Marsh Loop boardwalk, which is now being replaced with a wider boardwalk. Perhaps the new boardwalk will be wide enough to accommodate a group the size of WMB, but it will certainly allow people in wheelchairs and those who use other walking assistance to enjoy strolling and birding in the forest and marsh. Because it is what we do, we began marching out onto the dike and into the wind, at varying rates of speed, as not everybody relishes a blast of cold wind and few-to-no birds. But this week we were treated quickly to the sight of a young female Peregrine Falcon, sitting in the grass on the outer stretch of dike that contains North Pool. When I caught up with the folks standing near the tower, some who happen to have experience at rehabilitation centers said that the bird had made some moves as if it were injured. We walked out to the gate, pausing for better looks. After we observed the bird for a few moments from the gate, perhaps a bit closer than we normally would or should due to concern for the bird, she took off and landed nearby on the post of a staddle. No more fears about an injury. What a thrilling manner of flight, just powerful mastery, even on a little jaunt! That was pretty much it for WMB this week. In North Field, however, we again found an adult male Northern Harrier, who was magnificent, and we got glimpses of the two Snowy Owls again. I hesitate to report that one flew right over our van after we rounded a corner, so I was the only one who saw it, but so it goes. The list of species we saw is not very long, but the birds were spectacular this week. How completely precious is the rhythmic life of birds on Plum Island! It reminds us of how grateful we are that the folks at Mass Audubon had the vision and foresight to put Joppa Flats Education Center here. We are endlessly enriched with our regular immersion in the birds of the Great Marsh, and we welcome you to join us whenever you can. 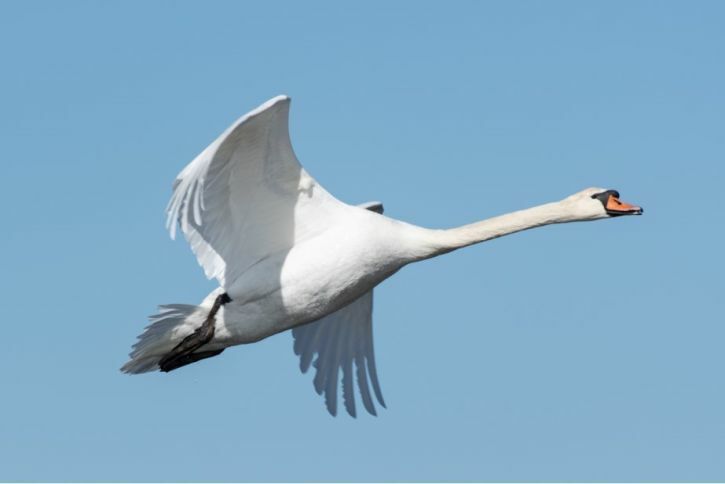 Mute Swan (11!) – 6, PI River, north of pannes; 5, marsh just north of Stage Island Pool, moving onto Stage Island Pool ice. Common Eider – common; north end. White-winged Scoter (~ 16) – ~ 10, north end; ~ 6, parking lot #1 (one) ocean. 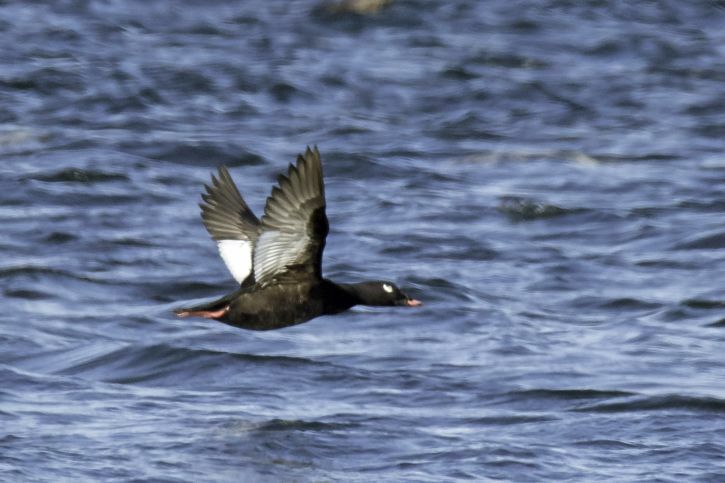 Black Scoter (~ 30) – ~ 25, north end; 5, one ocean. 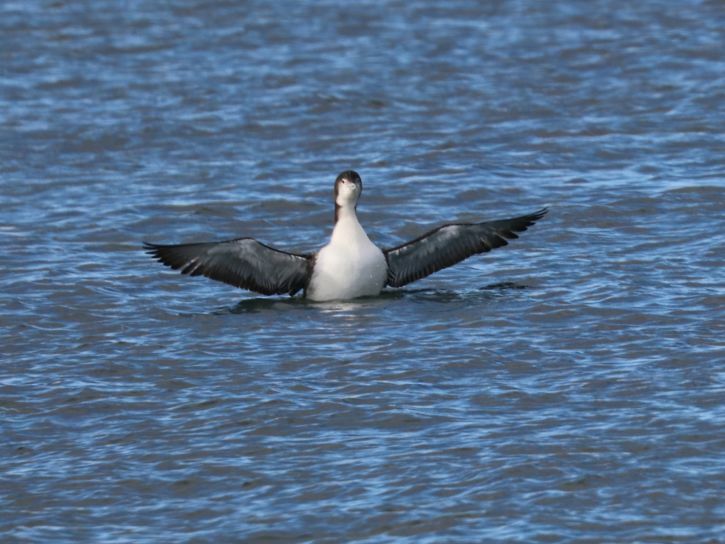 Long-tailed Duck (2) – one ocean. Common Goldeneye (~ 45) – ~ 35, north end; ~ 10, Plum Island River, north of pannes. Red-breasted Merganser (2) – north end. Red-throated Loon (1) – north end; showing color in head. Common Loon (3) – north end. Northern Harrier (2) – including 1 male. Red-tailed Hawk (1) – The Old Pines. Rough-legged Hawk (1) – light morph; Cross Farm Hill. Great Black-backed Gull (~ 10) – various. 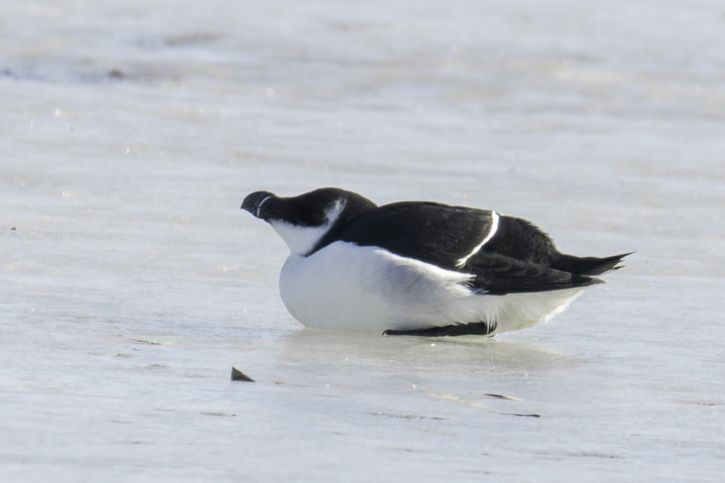 Razorbill (2) – 1, one ocean; 1, on Stage Island Pool ice. 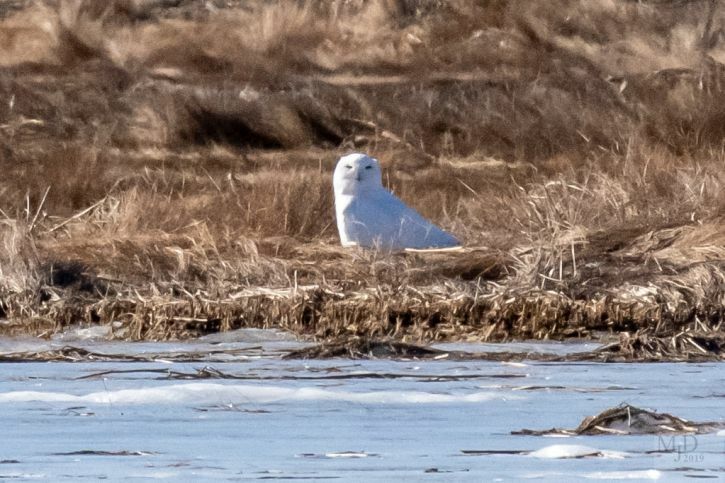 Snowy Owl (2) – 1 very white individual near west shore of Main Panne; 1 in marsh further west of Main Panne. Peregrine Falcon (1) – 1st-yr bird, probable female; North Pool dike just north of Hellcat dike. American Crow (~ 9) – various. Northern Mockingbird (2) – 1, parking lot #1; 1, Hellcat. European Starling – large flock on wires n. refuge gate. House Sparrow (1) – refuge gate. This entry was posted in Birding on February 8, 2019 by David M..